With adorable illustrations and inspiring quotes, "Crib Art" is a NICU-Friendly way to decorate your baby's nursery while in the NICU. How do you use a NICU Crib Art? Simply check with your baby's nurse to find the best place to display them. Most often, parents tape them to the outside of an isolette, radiant warmer, or hospital bassinet. An EveryTinyThingTM original design. Double sided designs - parents and babies alike can enjoy! Flip over to change the view & provide variety. 2 double-sided cards, 5 inches x 5 inches each - the ideal size for any NICU bed. Laminated with durable 5 mil clear lamination - can be sanitized as often as needed. Each set is secured in a cellophane bag. EACH SET INCLUDES 2 DOUBLE-SIDED 5" x 5" CARDS, FOR A TOTAL OF 4 IMAGES - Babies inside incubators & cribs can see one side while parents and caregivers all have inspiring quotes and sweet images to enjoy. 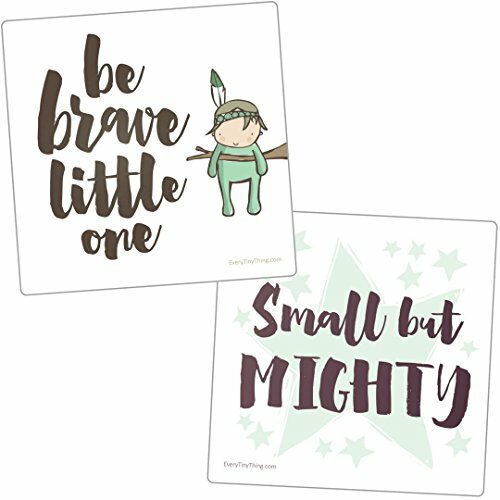 This set includes one card with "be brave little one" on the front and "small but mighty" on the back, and one card with "let him sleep, for when he wakes he will move mountains" on the front and "I am loved" on the back. THE PERFECT NICU BABY BOY GIFT - Not every gift is appropriate when a baby is in the NICU - some gifts can actually be upsetting to parents during this stressful time - but crib art is absolutely 100% perfect for any NICU baby. Whether a baby is in the NICU for prematurity, surgery, infection or any other reason, it's sure to delight NICU families. A NICU-APPROVED WAY TO PERSONALIZE YOUR BABY'S BED - Whether a baby is in an incubator, isolette, radiant warmer, bassinet or open crib, you can use these cards to bring cheer and inspiration. Designed by a NICU nurse to assure you that they're appropriate for use in the NICU. Because babies are messy, and NICUs are obsessed with cleanliness and sanitizing everything, they are laminated with thick clear coating so dirt and accidents can be cleaned up easily throughout your NICU stay. PERFECT FOR PREEMIES, TWINS, TRIPLETS AND MORE - Sets of 2 cards can be shared with twins, or each baby can have his or her own unique design to decorate the crib in style. We offer many different styles - "Dream" "Sunshine" "Brave" "Amazing" "Adventure" and "Miracle" in blues, pinks and gender-neutral colors. See all of Every Tiny Thing's product listings for all crib art sets. BABIES & PARENTS ALIKE LOVE THEM- Parents love how they personalize their baby's space, making the otherwise sterile and foreign environment of the NICU more welcoming and personal. For some parents, these quotes are the focal point in their space that keeps them staying positive. Older babies love having the bold & contrasting images to look at as they begin to explore their world. If you have any questions about this product by Every Tiny Thing, contact us by completing and submitting the form below. If you are looking for a specif part number, please include it with your message.